But seriously, how awesome is this picture? Step away from the kitty and drop that pork chop! Oh, crap. If there's one thing the internet loves (almost) as much as cats, it's bacon, and a terrifying sounding new allergy threatens to ruin amazing photo-ops, such as the one above. 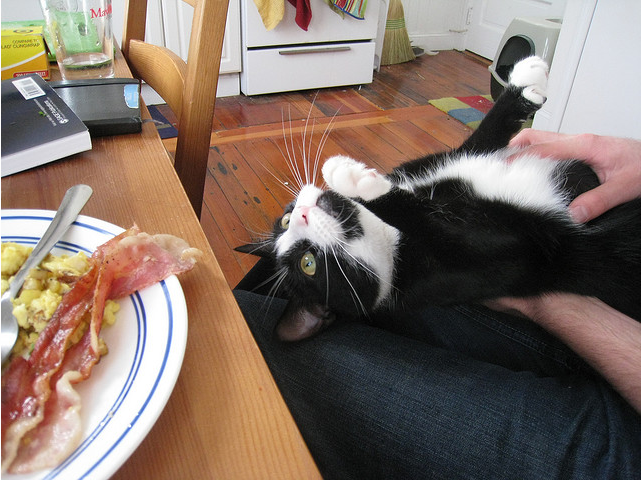 WebMD reports that sufferers of the unfortunate Pork-Cat Syndrome may experience itchy mouth, hives, and potentially life-threatening anaphylaxis, as a result of being exposed to each of the allergens (to clarify, that's being around cats and eating pork). The rare syndrome has been making its way around Europe since the early 1990s, but six cases, mostly among women with the average age of 28 (double crap) were recently documented on American soil. Preliminary results of a new medical study suggest that the rare allergy to felines and pork is a reaction to a protein of non-primate mammals, but more research is needed to better understand the unusual malady.